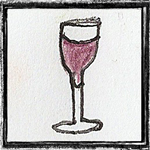 Wine etiquette – the wine you bring to parties (plus a couple fun selections) - A Romantics Perspective, by Jacquée T.
‘Tis customary to bring a bottle of wine to a party, yet the host or hostess is not required to share it. That etiquette may seem hazy. Folks might bring wine expecting it to be shared among fellow guests, a proverbial contributing to the “pot luck” of food and drink. And the host or hostess might receive the wine in that sentiment. Yet basic etiquette fares that the bottle of wine you bring is a gift for the host or hostess. Whether they share it or not depends on the party, the wine, and the way you present the wine you bring. When you arrive, no matter how busy the party, locate the host or hostess and hand the bottle to them. Say,”this is for you,” and know that from there they may put it in a personal stash, or on a table to share. If you desire the wine to be for them personally, then present it to them saying, “This is a gift for you,” and describe why you chose it for them. Perhaps it’s a carefully chosen Syrah as you know they favor Syrahs, for example. Or perhaps they like French wines and you bring a lovely Chablis. Either way, wine is a social aspect of the party. ‘Tis a gesture to make as an appreciative and courteous guest. Select as a gift that would make a fabulous (and delicious!) conversation piece — whether as a gift for the host or hostess or to be shared with guests! Here are two examples of fabulous wines to bring to a party. Both are from Michael-David Winery, a family owned winery in the California Lodi region. “This is one of my favorite just by itself wines,” says Kevin Phillips, Vice President of Operations at Michael-David Winery. “It’s medium-bodied, intricate, complex.” Mr. Phillips and his sister represent the sixth generation at the family winery. He oversees operations, and also works with Michael-David winemakers. Tasting notes from this romantic’s perspective: ‘Tis a hearty, soft body wine with a dry finish. For red wine lovers, bring Incognito Rouge. This is a hearty body red with soft tannins and a soft finish. Love the bouquet of dark fruits like plum and cherry. ***The heartiness and the complexity each wine offers, plus the “mask” labels make delicious conversation pieces — any time, and especially for Mardi Gras celebrations. More information: For more information on Incognito wines, visit here.